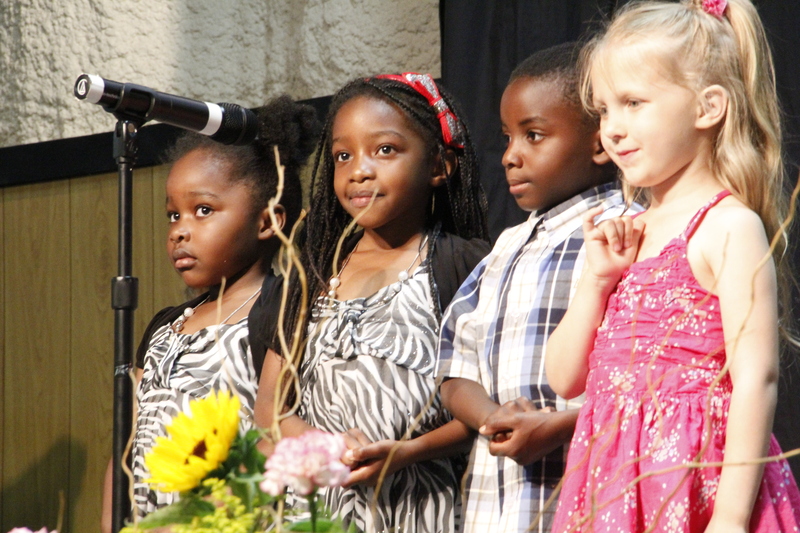 Maplewood Academy is looking forward to adding new faces at all three of our connected campuses for the 2015–2016 school year! If you know a student in grades 9-12, we would love to have them join Maplewood Academy next school year at our Minnetonka, St. Paul, or Hutchinson campus. At Maplewood Academy, not only are we focusing on educating our young people for a successful future in this world but also educating them for an eternity in Heaven with Jesus! For more information about how to enroll at Maplewood Academy, please contact Stacy Stocks, Principal, at 317-750-7890 or sstocks@maplewoodacademy.org. Also, please take time to view our student produced video in which students share personal testimonies regarding God working in their life at Maplewood Academy. On Friday morning, June 12, 2015, there was a buzz across the Maplewood Academy (MWA) campus in Hutchinson, MN as the finishing touches for the 2015 MN Conference of SDA Camp Meeting were being put into place. The anticipation of the arrival of attendees, the final touches on the auditorium and other parts of the campus awaiting the start of camp meeting at 7:00pm. 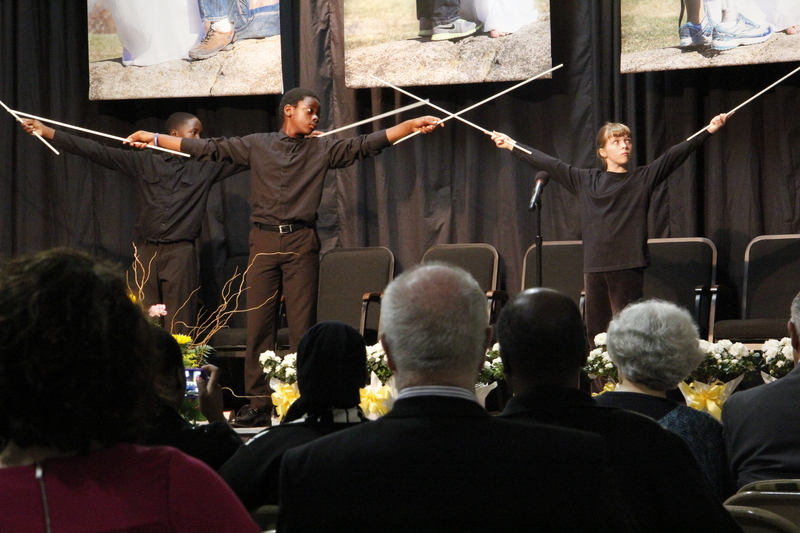 The flowers were in place, the musical instruments were tuned, the audio-visual equipment ready to livestream and record the designated events, the classrooms equipped and decorated in anticipation of all attendees including the lower division participants, and the final briefing of the camp meeting staff before the big hour. All were ready for the beginning of camp meeting. The time had come to say “Welcome to Camp Meeting”! The praise team, Christi Polensky Albertson, Clair Erickson, Jamie Madden, and Cheryl Saunders, led the congregation in hymns and songs of praise including the theme song, “We Have This Hope” by Wayne Hooper. At each of the Sabbath and nightly services, the theme song reinforced the emphasis on the Second Coming of Christ, the Blessed Hope. During our time at Camp Meeting, we were blessed with phenomenal guest speakers who truly took us to a mountain top experience! Elder Dan Jackson, President of the North American Division, spoke for the first weekend of camp meeting. Elder Jackson preached The Everlasting Gospel, The Three Angels Message. Throughout his sermons, he emphasized the immeasurable love that God has for all of His children. He (God) will go to great lengths to reach out to save us. “Christ will never abandon us”. We Have This Hope! Elder Jose Rojas, President of MOVEmentum LLC, shared the Power of Hope, Faith, Love, and Light along with the call to Come and Follow Me. Elder Rojas challenged the congregation to bring family members and friends to the nightly meetings. The attendees were reminded that, “Jesus calls sinners and always keeps His promises.” Jesus has called us “to be disciples and to take up your cross and follow me.” All were strongly encouraged to share the gospel of Jesus Christ with others. “Tell somebody that Jesus is coming again!” We Have This Hope! Dr. Elizabeth Talbot, Biblical Scholar and Speaker/Director for the Jesus101 Biblical Institute, was the final guest speaker for the second weekend. She passionately preached about the importance of rejoicing in Jesus. Dr. Talbot shared information that the outcome of earth’s existence is Satan loses and Jesus Wins! In two or three words, one can explain the end of the world respectively, Jesus Wins or Ta-Da! Jesus Wins! The sermons, Rejoicing in Jesus, Rejoice in Jesus Victory, and Rejoice in Jesus’s Faithfulness, concurred with the Bible that Jesus Christ is coming again soon to this earth to take His children home. We Have This Hope! During the first weekend, the Hispanic Ministry Department held a one-day meeting in the Hispanic Tent located on the MWA campus. The guest speaker was Dr. Ramon Canals, the Director of the Ministerial Department and the Vice President for Hispanic Ministries for the North Pacific Union. Dr. Canals presented The Greatest Joy, Preparing the Way for the Lord, and The Spirit of Possibilities, equipping the listeners to experience the joy of Jesus along with the tools in winning souls for the Lord. We Have This Hope! The Education Department of the MN Conference, led by Superintendent Mrs. Connie McCormick, presented Let The Children Come, an overview of Christian Education in Minnesota. It was a blessing to see children being dedicated to Jesus. Church schoolteachers, Sandy Daniels (Detroit Lakes School) and Tralese Syvertson (Anoka School), gave testimonies of their work and how the Lord used them and the children they work with to make a difference. Arielle Cady Flores, music teacher at Minnetonka Christian Academy (MCA) presented a violin musical testimony, Deep River by Samuel Coleridge-Taylor, with piano accompaniment by Rayleen Hansen, principal of Southview Christian School. Students from across the Minnesota Conference presented additional music. Elder Hubert Cisneros, Director of Church Ministries and Youth Ministries for the Mid-America Union, challenged all listeners to have positive, spiritual interactions with and influences on children. Such interactions and influences will have implications for eternity. We Have This Hope! Workshops and seminars were in abundance at camp meeting. 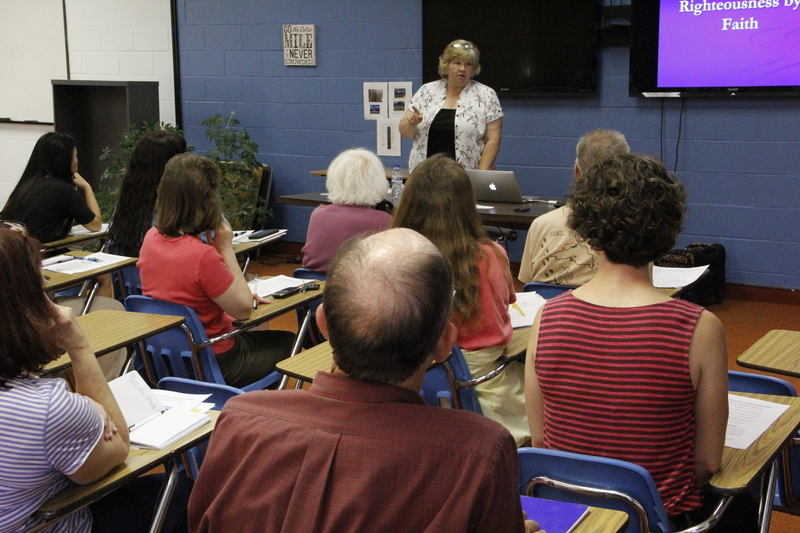 The variety of workshops covered a myriad of subjects including spiritual, physical, emotional, and financial health and wellness; cross-cultural ministry interactions, faith and culture, How to study the Bible, prison ministry training, sexuality and the church, community services, finding Jesus, various aspects of evangelism, women’s and children’s ministries, to name a few. There were activities for everyone including the children. The youth divisions had a global, mission-oriented activity that got them talking about social justice issues and broaden their awareness of homelessness. 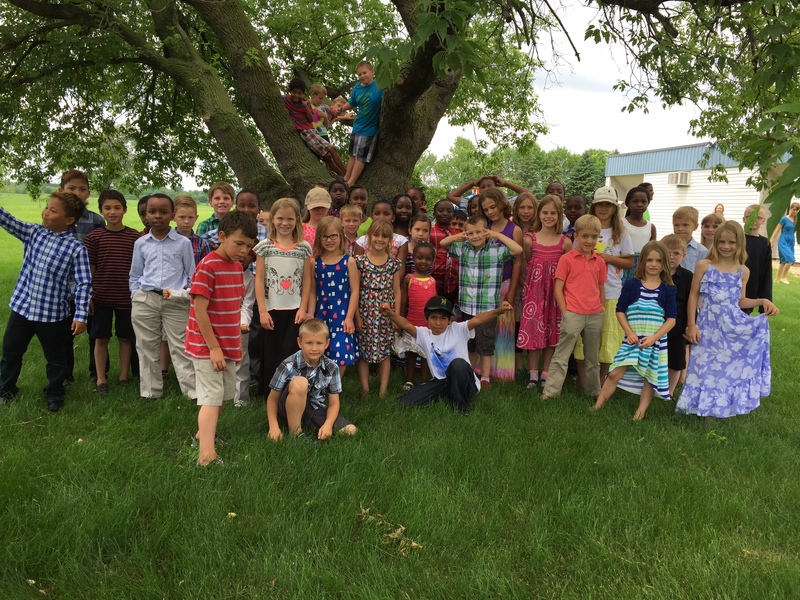 In response to global missions, the primary class raised $3000+ for Nepal during the camp meeting week. This was an amazing act of love shown by the attendees at Camp Meeting and friends who did not attend to do something for someone less fortunate. 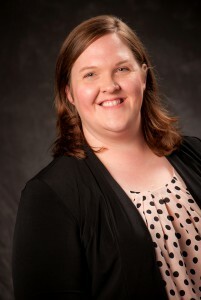 Vanessa Pujic, Youth Pastor for the Minnetonka Church, coordinated the Young Adults Program. Special guests and workshop presenters were Dr. Conrad Vine, President of Adventist Frontier Missions, Buell Fogg and the U-Crew from Union College, Bill & Marilyn Glassford, mission directors for The Pine Ridge Mission along with other presenters. The Minnesota Conference celebrates the various ministries actively sharing the love of Jesus in the State of Minnesota. 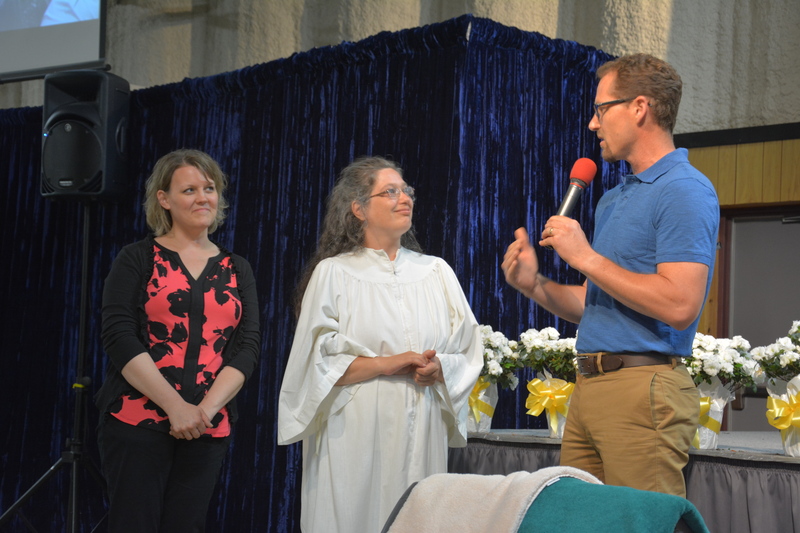 During each service, a ministry was profiled as a testimony of the work that is occurring throughout the conference. The staff/students from Maplewood Academy and North Star Camp presented the Sabbath School programs, respectively, in addition to sharing information about their ministries. 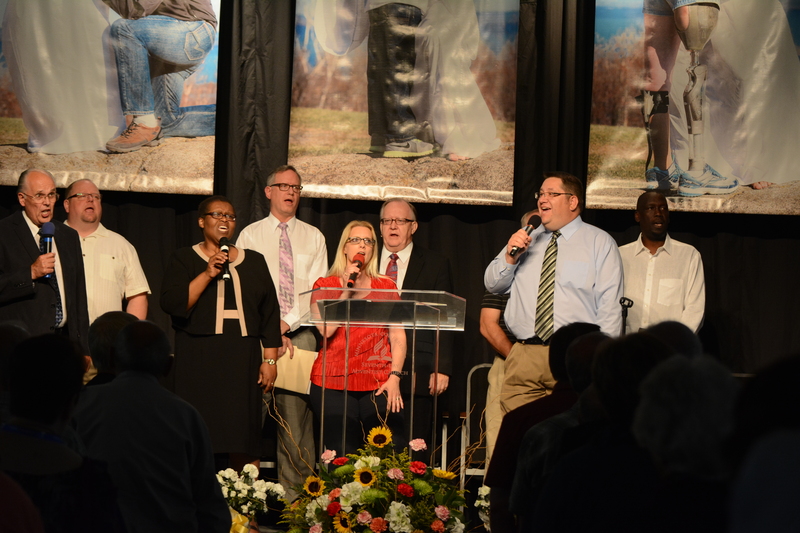 The music ministry portion of camp meeting exemplified the diversity of the Minnesota Conference. The diversity reflected ethnicity, culture, age, regional, music genre along with various instruments. In addition to the aforementioned praise team, the U-Crew from Union College also led the praise and worship. The music throughout the week included Elizabeth Daniels (Detroit Lakes), Shaun Osvold (The Edge), Tim Olson/Hazel Myers/Jude Keller (Southview), Clair Erickson (Park Rapids), Charity Duran (The Edge) and Jose Rojas, Duo from the U-Crew, Kathy Parks (Buchanan, MI) with Christy Polensky Albertson (Andover) and Karin Polensky Schultz (Grand Rapids), Pastor Dustin Hall (Southview), Kari Morrison (Hutchinson), The Pilgrim Singers (Southview), and the A Capella Quartet (Minnetonka). The musicians were Jana Erickson (Park Rapids), Jude Keller & Tim Olson (Southview), Connie McCormick (Pathways), Loelle Tenold (Westview), and Cheryl Saunders (Southview). Camp meeting experienced a full music program organized and coordinated to glorify God and to prepare the hearts to receive the spoken word and the Living Word. 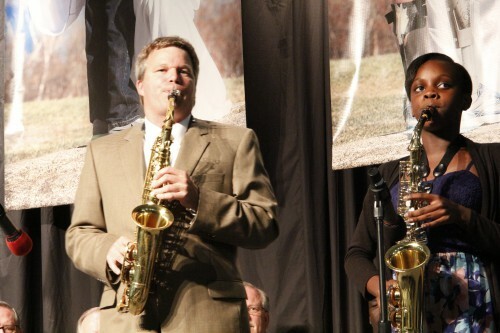 Additionally, on the second Sabbath of camp meeting the music department held a “Multi-Talent Program”, highlighting music in the Minnesota Conference. The Pilgrim Singers (Southview) sang in one of the dialects of Kenya, the camp meeting Kindergarteners sang songs highlighting their dedication to missions and said “hello” in various global languages, the Primary class sang “Make Me a Servant” and shared their Missions to Nepal fundraising activity, Kenny Cheever (Pathways) played “Moment by Moment” on the psaltery, the staff from North Star Camp presented a skit about Jesus and Peter, Javier Chuquimia (Northfield Hispanic ) played a piano medley of Christian songs, Pastor Dustin Hall (Southview) sang “Glorious Freedom” by the Gaither band, Nicole Hardt (Blackberry) powerfully sang “In Christ Alone,” The A Cappella Quartet (Minnetonka) sang “Amazing Grace” with much fervor, 9th grader Hayes Keller(Southview) sang the medley, “Blessed Be the Name/There is None Like You” while the Southview Youth Ensemble sang “Lord, I’m Available to You”. During the program, Pastors Ronald “Ron” Booth and David “Dave” Fish, who are “retiring” were acknowledged for their years of pastoral ministry and commitment to preaching the gospel of Jesus Christ. At the conclusion of the multi-talent program, Pastor Dustin Hall offered an invitation for someone to give his/her heart to Christ. The audience responded dedicating and rededicating their lives to Christ. In addition, there were those who came forward for baptism. We Have This Hope! The highlight of camp meeting was the baptism of two souls who wanted to commit their lives to Christ and to follow Him. They had “Decided to Follow Jesus” and did not want to delay their public expression of the inward change that God had made in their lives. The two baptismal services occurred on the Thursday night and the second Sabbath afternoon during the Multi-talent Program of camp meeting. To God Be the Glory! We Have This Hope! As the Camp Meeting progressed, there was a crescendo of enthusiasm and commitment to the Lord. There was a buzz at the camp meeting. The Adventist Book Center (ABC) presented opportunities to receive Christian literature and materials. Other entities held fundraisers to support their different ministries. Rain could not dampen this Spirit, the “State Bird” (mosquitoes) en masse could not interfere with this ardor, and the other challenges that may have existed at the encampment only brought resolve. The attendees had purposed in their hearts to follow Jesus all of the way. “We have this hope that burns within our hearts, Hope in the coming of the Lord…” because JESUS WINS!!! 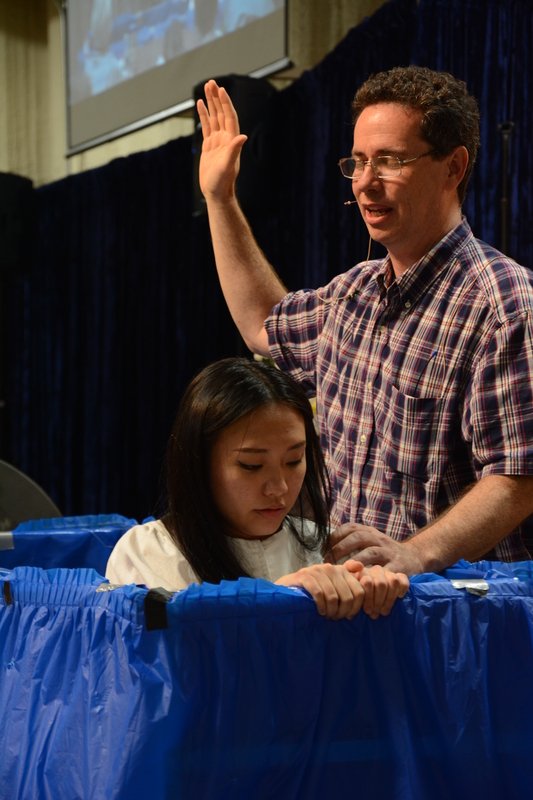 Eighteen-year-old Traci wanted to be baptized for the last two years. Growing up in the Hmong culture, she was not raised as a Christian. When economic struggles forced her family to move in with an aunt and uncle, they soon began to experience paranormal activities as well as demonic attacks. A Facebook friend of hers told her about Jesus and after more attacks, she accepted Christ in her life. The attacks vanished! After studying with Mormons, and then Pentecostals she felt confused. A Seventh-day Adventist teenage friend of the family told her about what the Bible teaches, and she felt like it made sense and was the truth. Pastor Salee and his wife Terry, living in the Wisconsin area began to mentor Traci by phone. 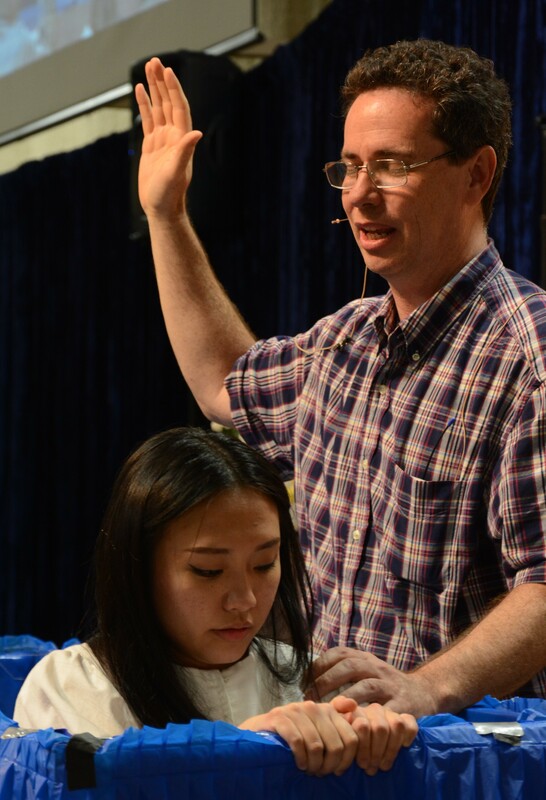 She began to change her lifestyle and soon sensed God calling her to medical work and youth ministry. When Terry contacted Karen Lewis about mentoring Traci in Bible work, Karen suggested Traci attend camp meeting since she would be doing an entire track of seminars on Friendship Evangelism and Bible work. Terry made the arrangements for Traci to attend camp meeting and Traci loved it! She attended both the youth class as well as the Bible study classes, not only being mentored by the teachers there, but also shared her personal testimony. Pastor Tony Jasper baptized Traci on Thursday night after the evening program. She was hugged and congratulated by all her new friends. Please continue to keep Traci in your prayers as she wants to attend a Seventh-day Adventist college this fall. Tammy was also baptized on Sabbath at the 3:30 Music Program. Having been through two abusive marriages she was desperate for peace and truth. Last July she attended a friend’s church and heard the gospel for the very first time. She cried like a baby with her head in her lap after the sermon. It was that day that she gave her life to Christ. She called her mother and sister, both Seventh-day Adventist Christians attending the Andover church, and asked the pastor if he knew of anyone who could do Bible studies with her. Pastor Adam immediately suggested Shannon Muehlberg who had been trained in Bible work. Tammy, who loved the studies, and Shannon, became a good friend and a mentor to her. At one point, Tammy knew she needed to get rid of all her pagan, occult books and materials. Shannon suggested she throw them in a bon fire at her house and when they prayed and threw everything in the fire, a weight lifted off her and she felt God’s peace. 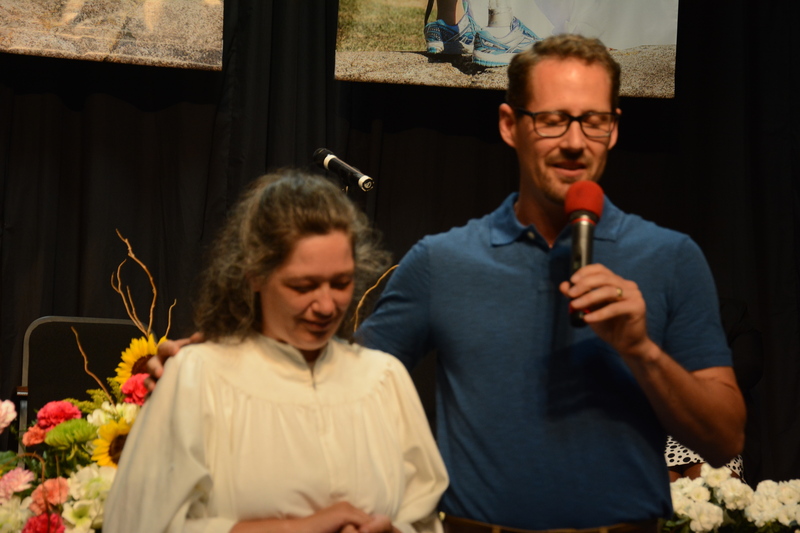 One of the highlights of camp meeting for Tammy was not only her baptism by Pastor Adam Breiner, but the fact that her four-year-old grandson, Sonnie, who is being raised Muslim was able to attend camp meeting with her. Sonnie had a fantastic time in his kindergarten class and learned all about Jesus. By the end of the camp meeting he wanted to give his heart to Jesus. Nine-year-old Micah attended camp meeting for the very first time with his grandmother Barbara. They came Wednesday night and after his primary class, ran into the auditorium class to sit with his grandma. Elder Rojas made an appeal that night asking folks to come forward who wanted baptism. Little Micah got up from his chair and immediately proceeded to the front of the platform where he promptly thought he would be baptized immediately! During popcorn and watermelon Micah excitedly introduced his primary teacher, Ken Mayberry to his grandma and ran around with his new friends. “I love it here. I want to live here” he exclaimed to his grandma. Micah is beginning Bible studies soon and wants to be baptized. Camp meeting is not only a time when our members come out for a season of spiritual refreshing but also gives God the opportunity to work miracles in the lives of people. It is clear that God is working on the hearts and minds of people on this campus during camp meeting. These are just a few of the transformational experiences that were experienced on this campus. Praise God for camp meeting! No two people ever experience an event in the same way, but I am quite sure that I was not the only one blessed by the Sabbath afternoon education program on June 13, 2015 during Campmeeting this year. I had an interesting perspective as I experienced some nervousness for the little bits that I took part in, but waiting “backstage” provided an opportunity to receive encouragement from other participants. 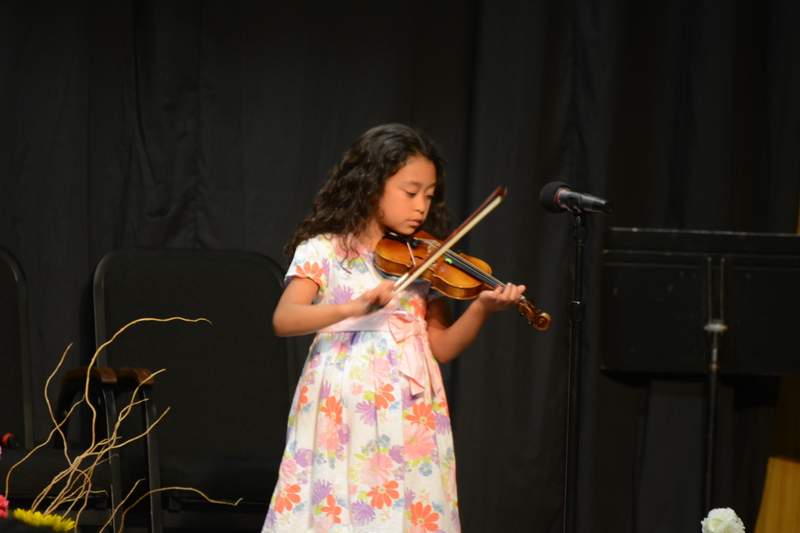 I was reminded of why I am a Seventh-day Adventist Church school teacher as I listened to the children play instruments like violins and guitars, and others sang so beautifully! Musical worship was made visual by tiny students “signing” and singing while others performed motions to music with simple dowel rods. It was evident that parents and teachers had helped the students prepare so that each number was carefully planned and practiced. Dr. Hubert Cisneros shared personal stories that underscored the importance of a Christian education. He gave examples of how teachers can touch their students for a lifetime of success here on earth, and more importantly, for eternity. The most poignant event in the afternoon, for me, was the child dedications. Parents and grandparents were encouraged to bring their children to the front of the auditorium and present them to be blessed. 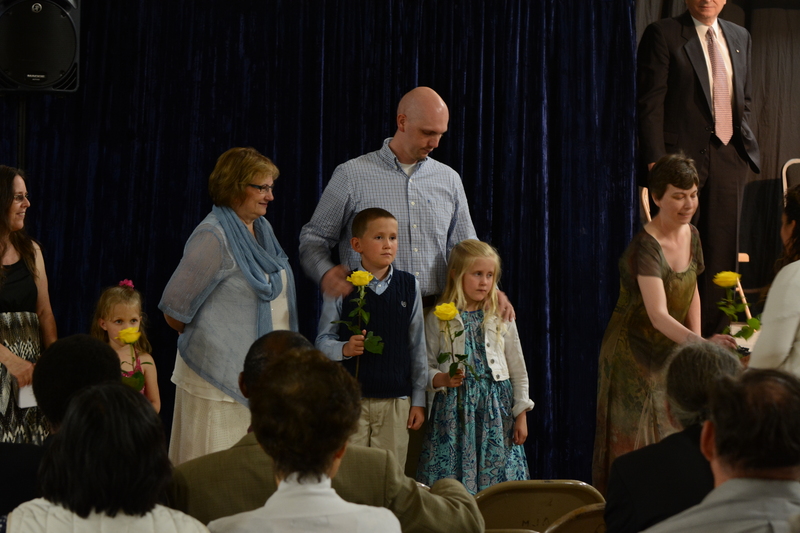 Yellow roses were given to each child along with an assurance that Jesus loves them, a book and a certificate. I could see, throughout the program, the clear message that the Minnesota Conference loves their children. They were involved, spoken for, and encouraged. Please pray that God will continue to bless our children through their parents, teachers, and schools. Wednesday evening of Camp-meeting 2015 ended with smiles and laughter as Connie McCormick and Melisa Mauk, of our Minnesota Conference Education Department, led out in a “mouth-watering” event. 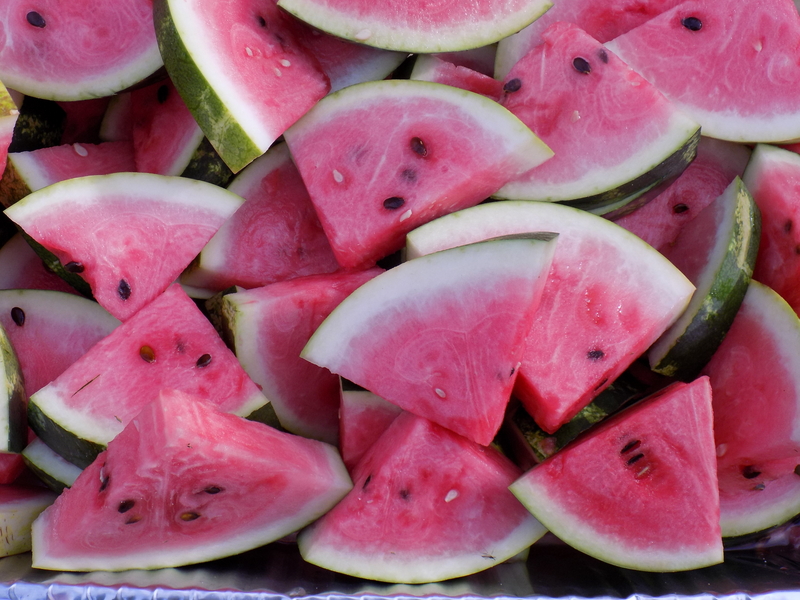 Volunteers lined up with knives in hand as watermelons were brought from a farmer’s wagon to their designated “cutting areas” outside the Adventist Book Center building. Light pink to dark red wedges were cut and placed in large serving trays. When the evening meeting let out, many found their way to sample the melons. What a great time it was for the volunteers to get to know each other and share this evening in service to others. Throughout the event, Melisa Mauk collected donations which were given in support of this year’s Outdoor School Program. 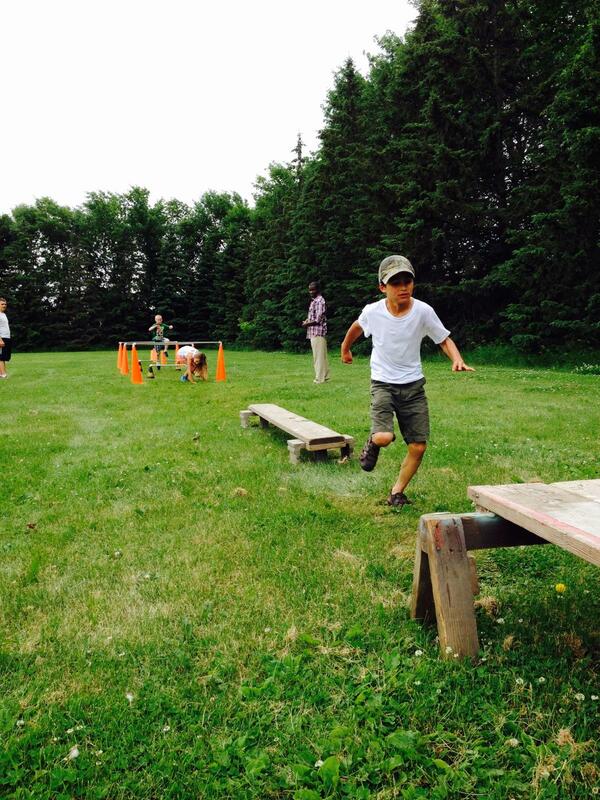 As many of you know, the Outdoor School Program is designed to provide opportunities for students in grades 5-8 to enjoy outdoor experiences, enhancing their physical skill levels, higher level thinking skills and hands-on learning experiences. How blessed we are to have such caring hearts and supportive brethren to maintain and uplift our educational program! 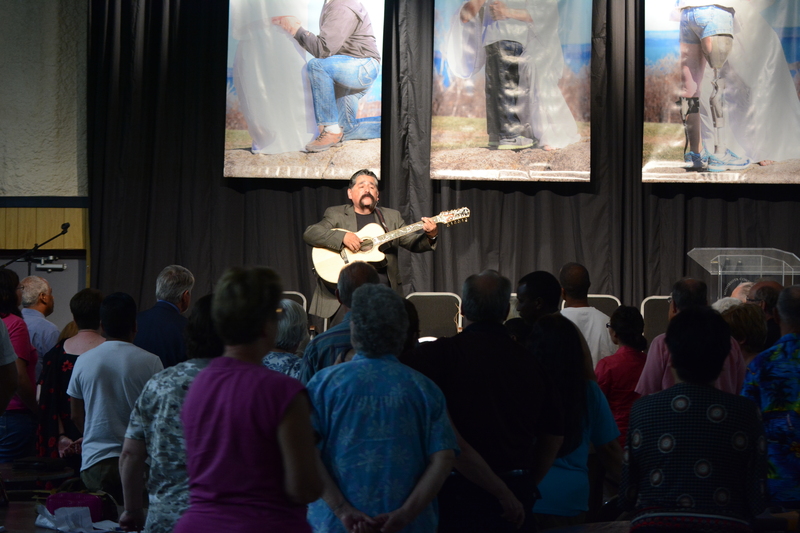 Wednesday evening of Camp-meeting 2015 proved to be more than just a blessing. It was a powerful example of church members, alumni and school family happily sharing together in a common cause; supporting our students!!!!! What a fine example of Christian Fellowship for our young people and new members to experience!!!! 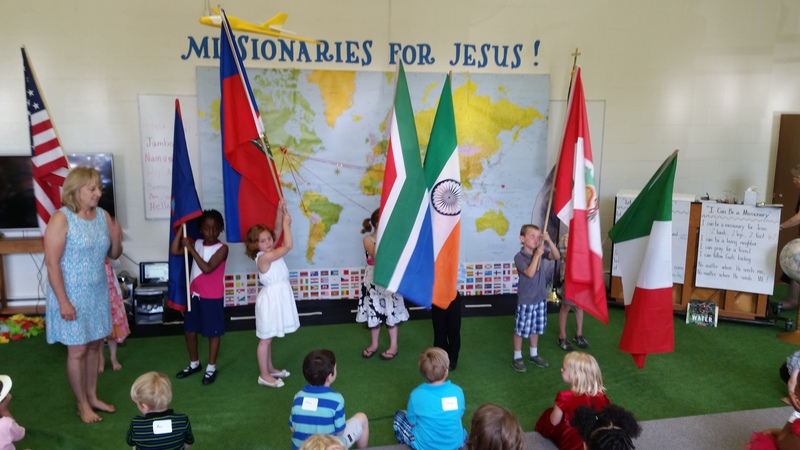 This year at camp meeting, the Kindergarten class traveled around the world as missionary pilots each day. Their destinations included: South Africa, India, Haiti, Guam, Peru, Mexico, and the United States. The children enjoyed visits from missionaries that had served in each country (some short-term and some long-term). The children learned a little bit about each country, a few words in each local dialect, and what things missionaries can do to help abroad as well as locally. 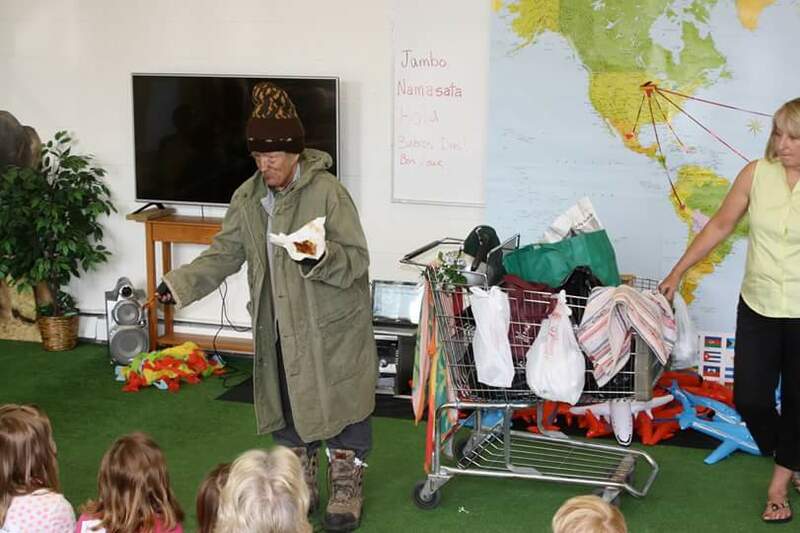 The children were completely silent when they had a visit from “Homeless Helen” as they heard her describe living on the streets, showing the little mat she slept on, and showing how she would eat leftover apple cores and pizza crusts for a “delicious” meal. Their tender hearts were touched, and they streamed forward to give her hugs before she left with her rickety cart of belongings. That afternoon, the children visited the local food shelf and donated almost 100 pounds of food. The class was also blessed with beautiful weather all week, and the children were able to enjoy a building project (for a mission church school), slip-n-slide, making card-board shelters, games, lots of crafts, songs full of actions, and listening to Eric B. Hare mission stories while coloring each country’s flags. 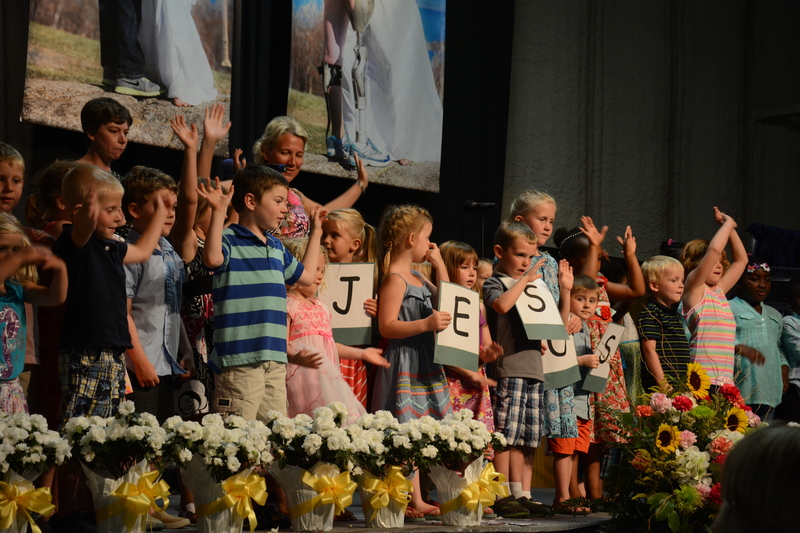 Both the children and teachers were blessed as leader Diane Sorenson created a passion for mission in each of the little kindergartener’s hearts. With eager spirits and relentless energy, the children in the Primary Division at camp meeting, after hearing about the needs of the earthquake victims in Nepal, seized the opportunity to raise money for ADRA’s Nepal earthquake relief. The challenge? To find sponsors who would pledge money for each completed circuit through an obstacle course and to run as many times through it as they could in about 30 minutes. Before each group of children started off, an instructor would run through the course to demonstrate how to negotiate each obstacle. He reported feeling fatigued after three circuits and talked about how proud he was of the kids for their perseverance. It was a hot day and the children were strongly encouraged to stop for water breaks. Many refused, or reluctantly stopped for a few moments. With red, perspiring faces, their breathless mantra was, “Gotta keep going for the people of Nepal.” The numbers varied from 8 to 10 circuits to a Herculean 27 times around the course. Each child did their best and gave it their wholeheartedness. Our goal was to raise the modest sum of $200. Because of the generous support of family, friends, and camp meeting goers, the Primary Division was able to raise over $3,200.00 to help the victims of the April 2015 Nepal Earthquake. Thank you to everyone that helped nurture a missionary spirit in our children.